Before we get to the weather, I’d just like to say how much I, as well as many other students and staff at Central Kitsap High School, loved Ms. Frances Story. I knew her as a funny, sassy and quick-witted grandmotherly figure who knew how to teach students in the most memorable of ways. Ms. Story passed away after a long battle with lung cancer this week and she will be greatly missed. Labor Day itself will be overall lackluster and forgettable; that is, if your life revolves only around weather. If it doesn’t, then the outcomes of Labor Day will largely be in your control. 🙂 A thick marine layer of clouds will make for a mostly cloudy start to the holiday, but skies should clear enough to allow temperatures to at least hit the low 70s when all is said and done. And then…wow. September will come in with a summery bang! As it appears now, we may be looking at an all-too-common case of 80 plus degrees in September. 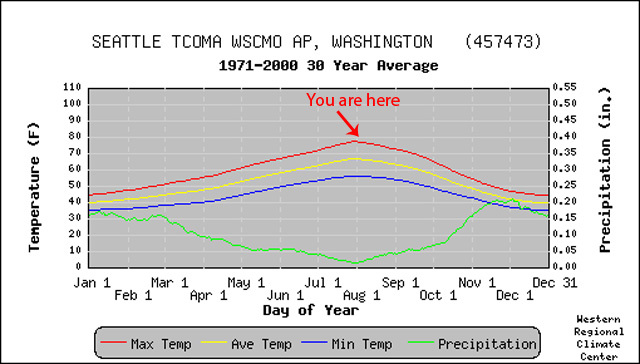 In fact, according to monthly temperature data gathered at Bremerton Airport, the last September we had that DIDN’T reach at least 80 degrees was back in 2005, and even then we got to 78. So this isn’t too rare, but we’ve certainly been spoiled these past 7 years! Tuesday through Friday of next week will be one gradual increase to 80 degrees and, potentially, beyond. A thermally induced trough will likely set up shop once again which could take temperatures a few steps further. For now, we’ll go conservative with highs on either end of 80 🙂 Oh yeah, and did I mention skies will be mostly if not completely sunny most all of next week? Score! Have a safe and enjoyable Labor Day weekend everyone! Did you win the rain lottery? And will there be more winners? In the meantime, there won’t be anymore soaking rugs as a ridge of high pressure–albeit weak–builds offshore. Before we get to that we’re going to have to wring out some left over clouds tomorrow. We’re not looking at anything dramatic, just mostly cloudy skies clearing to partly sunny skies in the afternoon. Friday and Saturday will feature more of the same, but as the ridge strengthens the temperatures will rise from near 70 tomorrow to the low and mid 70s over the weekend. 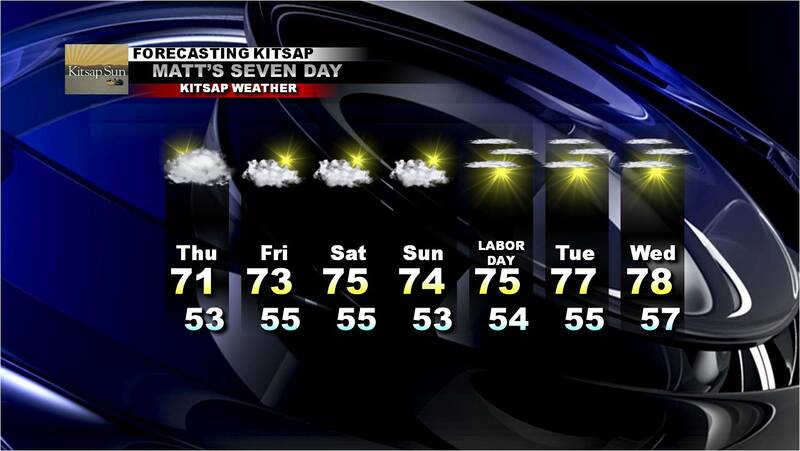 Labor Day looks beautiful and skies will clear even more, boosting temps to the mid and upper 70s. And then there’s the long range forecast. Remember how we talked about a warm start to September a few weeks back? Looks like that could still materialize. Current model projections have us perhaps reaching the 80s by next weekend. 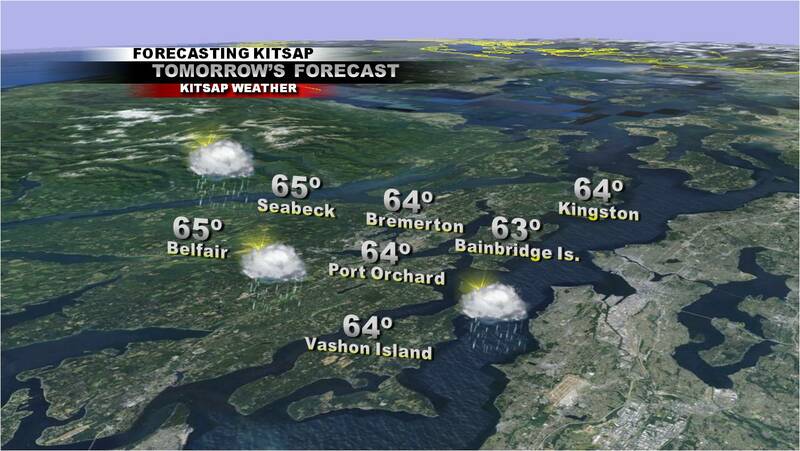 Today is a perfect example of why I love forecasting the weather for the Kitsap Peninsula. No, I don’t love getting it wrong, but sometimes I’m glad when I do. Remember how a few days ago today was supposed to be mostly cloudy with rain? 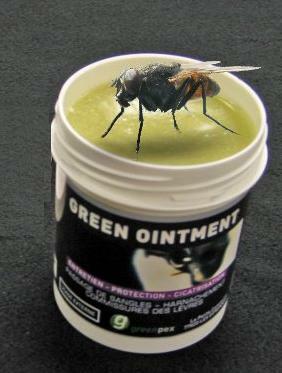 Well, so much for that! In fact, today’s forecast was the exact opposite with highs reaching the mid 70s under sunny skies. But why the change in weather? Do weather forecasters just guess the whole time and somehow get lucky? It certainly seems that way, especially with the unpredictability of the weather this summer. But there’s a lot more of a science to forecasting than most think. It’s just that this part of the world is a little more difficult to forecast in for a number of reasons. First, the Pacific Northwest is geographically one of the hardest areas to forecast weather due to no current weather stations out in the Pacific to send feedback to us. Having a big, dark ocean to our west is kind of like trying to forecast with both eyes closed. Everywhere else in the nation there’s a state next door to help out in forecasting a progressing storm, but not us. We have to rely on what the ocean tells us! And believe me…it’s not nearly as reliable or close as we’d like. Second, dramatic weather events in the west Pacific can sometimes alter our own forecasting models, calling for an 80-degree weekend one day and a cold, rainy weekend the next. This is exactly what is happening now. National Weather Service meteorologists in Seattle discussed today that weather model consistency will likely flip-flop over the next several days due to “flies, in the form of typhoons, in the ointment over the western Pacific”. 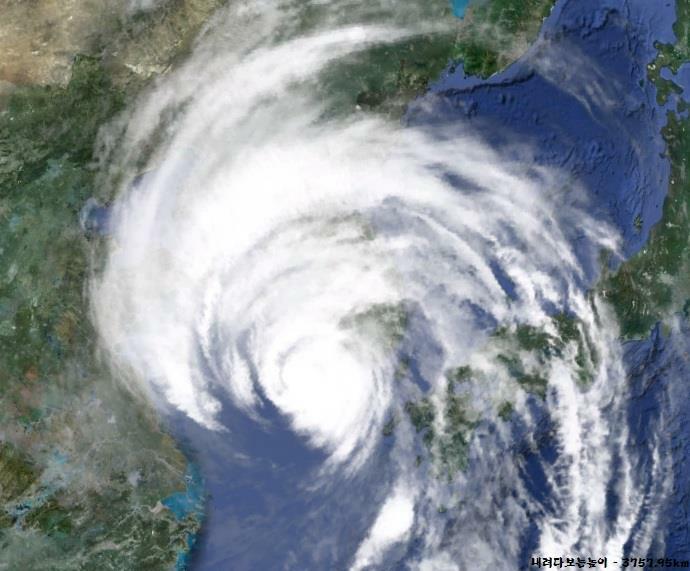 Who knew severe storms heading towards Taiwan and the Korean Peninsula would have that much of an effect on our forecasting capabilities! After today’s high of 76 degrees, we’ll cool it down a notch to a more seasonable 74 degrees tomorrow with a little more cloud cover. 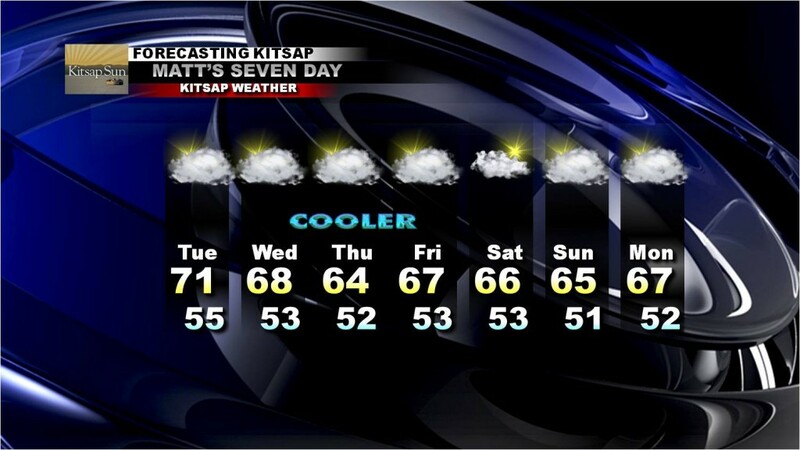 Wednesday will be a little cooler still with the chance for rain most likely in the southern regions on the Kitsap Peninsula. In fact, the latest weather models indicate the northern half of Kitsap County could stay completely dry. A closer look at the raindrop: Why are there different sizes? What a beautiful day! 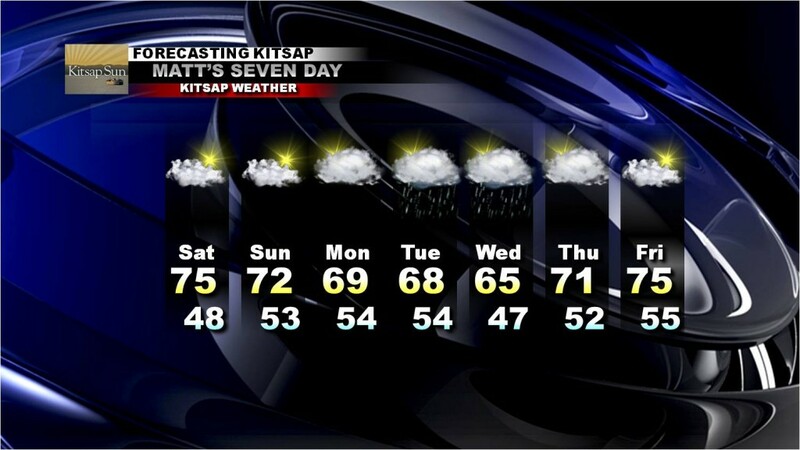 Bremerton National Airport recorded a high of 66 today while many other locations hovered on either side of 70 degrees. And yes, it was a chilly one this morning! Temperatures dipped as low as 39 degrees at Sanderson Field in Shelton and it will be another chilly one tonight. This is just one of many signs that fall is coming. Another sign? Increasingly wetter weather. My sister called me a couple weeks ago from North Carolina and asked me why some raindrops are large and others are small. She noted how after a thunderstorm rolled through their area, the raindrops were impressively large and she had never seen anything like that in Washington. So why the difference and what causes it? First of all, let’s begin with the cloud. Clouds are made up of water vapor which wraps itself around little particles called condensation nuclei (ie smoke/dust particles). As this process occurs, the little raindrop is born…but it’s sure a lightweight! 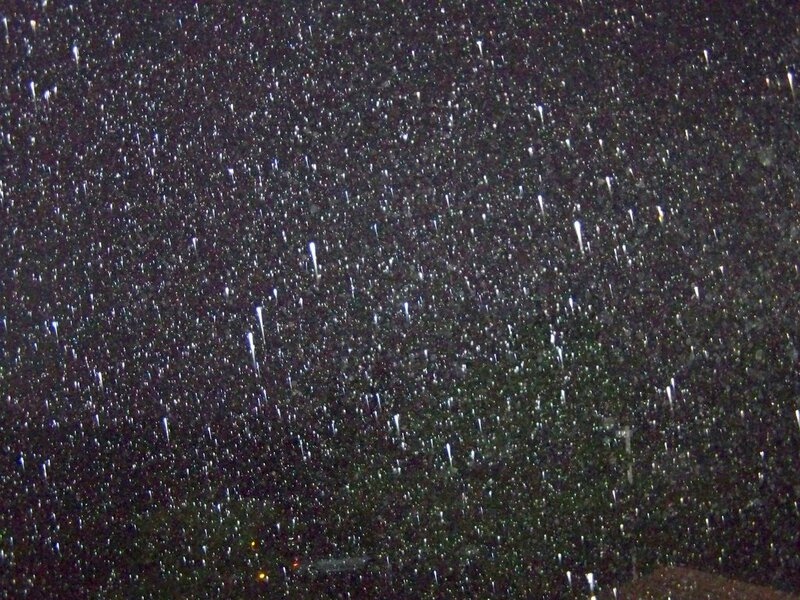 “Newborn” rain droplets can be as small as 0.0001 centimeters in diameter! At this point these baby drops are too light to fly out on their own. Luckily, the clouds they are raised in are small enough to ensure a little game similar to that of bumper cars, except when a raindrop bumps into another raindrop it grows in size! Interestingly, these raindrops aren’t tear-shaped like most artists portray them to be. In fact, the average raindrop looks more like a hamburger bun! The “bumper car” process continues until mom can’t take it anymore and kicks the now teenage raindrop out of the house (I think some parents are understanding the process of raindrop development MUCH better now! ;)). In other words, the drop becomes too heavy that it quite literally drops out of the sky and onto our umbrellas. However, as the teenage water droplet leaves the home it picks up a lot along the way, especially with several updrafts, or sudden gusts of wind that cause the drop to run into other drops. During this process, it continues to grow and grow until finally it hits the ground. 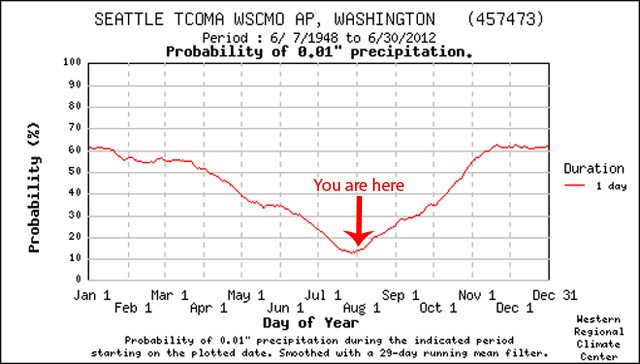 So why doesn’t Washington have huge raindrops? Perhaps as these storms come off of the Pacific they don’t have as much time to build up juicy water droplets that often fall in the country’s midsection. Also, a lot of the rain we get isn’t very heavy or associated with much wind to begin with. 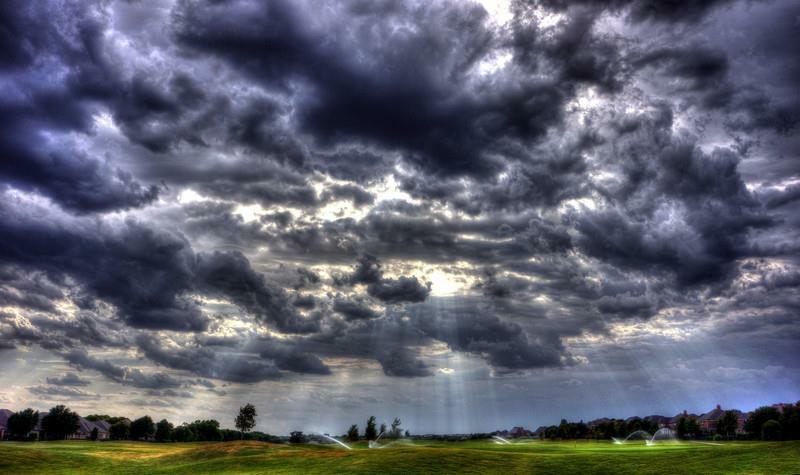 So a windy, unstable and moist climate is the best bet for large raindrops! Have an awesome weekend everyone. 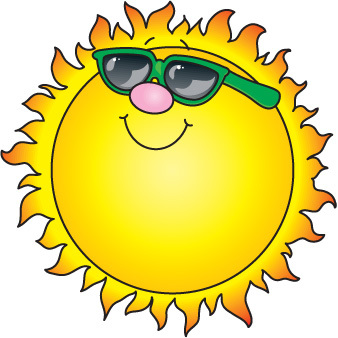 Enjoy the sun! Raindrops have entered the forecast! Although Seattle is known for its often cloudy, wet weather most days of the year, the summers here are known for being pleasantly cool, dry and storm free. But the closer we get to September and the fall season, the more likely it is to see raindrops entering the 7 day forecast. And wouldn’t you know it, after a month of waiting, you’ll find Western Washington back to doing what it knows best. Well, to some degree anyway. Didn’t it feel a little chilly this morning? Some Kitsap locations woke up with low temperature readings into the 40s and we didn’t warm up to our high temperature of 72 degrees until…well, 15 minutes ago. In fact, we spent a good chunk of today 10-12 degrees below our average high temperature. But it’s amazing what a few sun breaks can do! 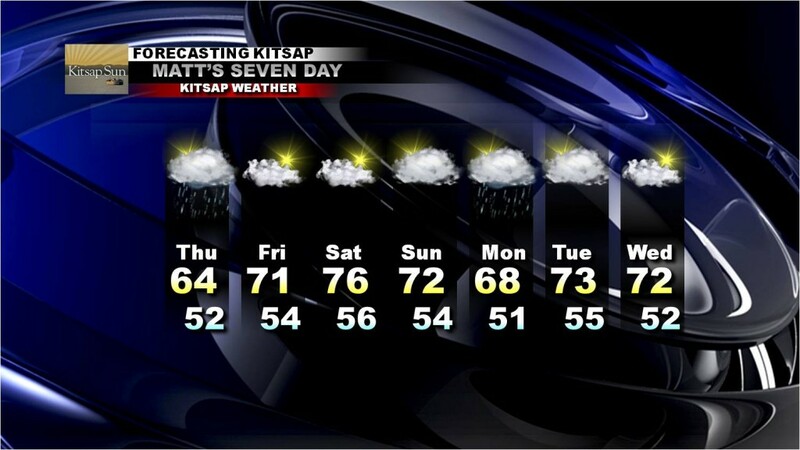 This won’t be a Kitsap County Fair washout by any means, so don’t let this forecast detract from your plans tomorrow! But if you insist on “fair” weather, just wait until the weekend! Skies will clear Friday and Saturday providing temperatures the opportunity to reach the low and mid 70s. I’m glad the forecast models have changed their tune for the weekend. It’s looking a lot nicer than what was advertised a couple days ago. And just as the festivities wrap up, so does the warm and dry weather. Sunday through Tuesday look like a mix of clouds and showers with only a few sun breaks. The most widespread chance of rain will be on Monday, but it’ll be hit and miss on Sunday and Tuesday. Highs will cool back down to the mid 60s and lower 70s. Long Range Thoughts: We may not see 90 degrees again until 2013! Granted we usually average about 5 days a year at or above 90 degrees, I am confident in saying we’re done with our streak of 90 degree weather…at least, until the year 2013. There are a lot of natural reasons why this would be the case, but it looks like other factors could play a role in keeping us more on the normal to below normal side of things in the temperature department. So, statistically speaking, we’re just naturally going to be getting a bit colder and wetter from here. But you already knew that! The CPC, or Climate Prediction Center, released in their latest prognostic discussion that lowering heights (lower pressure) will be a dominant factor along the west coast and the northern tier of the U.S. We’re certainly not going to get downright cold by any means, but certainly a return to the more typical cool, cloudy and, at times, wet forecast. As for the short term, however, rain won’t be a factor for the next 7 days (aside from, of course, the random thunderstorms that are predicted to show up this afternoon/evening, but even then it will mostly be dry lightning). Highs in the forecast period will fall below normal to the upper 60s and lower 70s and clouds will continue to be a morning and night event. You can always remain hopeful for the afternoon sun breaks each day, however, so we won’t be totally closed in. 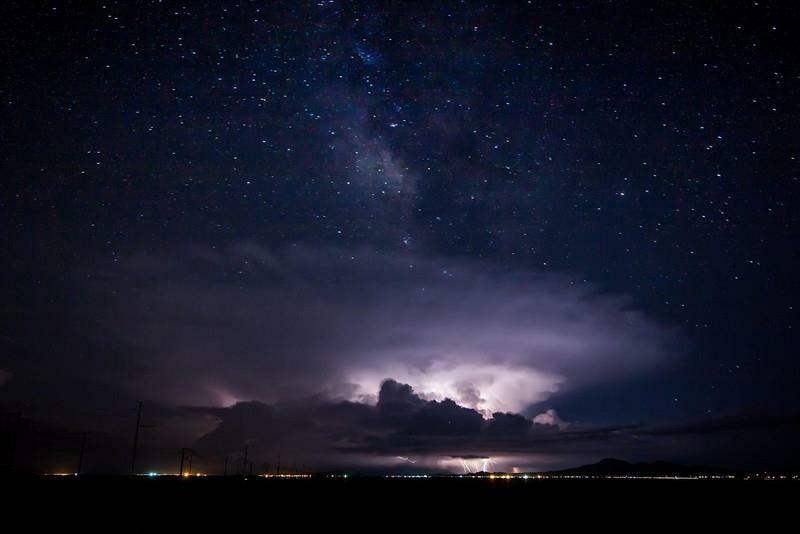 Try to take some shots of the lightning tonight if you can! I’ll be traveling back to Silverdale tomorrow morning. 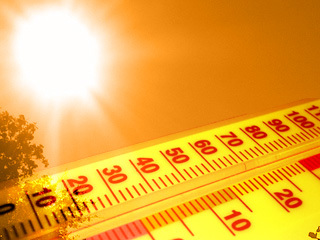 Tracking the heat, thunderstorms and more: I could use your help! So a tad warmer than August 4th, when we found ourselves on either end of 90 degrees. The thermal trough moves north tonight and into tomorrow, which will mean a dramatic cool down and increase of clouds on the coast, but another hot day inland. Highs will be a little warmer than today, but there’s the off chance this thermal trough chugs it’s way through the area a little faster than anticipated which would keep the temperatures in the upper 80s verses near 100 degrees. The record for Sea-Tac In’tl airport on Friday is 96 degrees set in 1977, and it looks like most areas around the sound could get close. Then the trough moves on and we’re left with the back end of it. The cool down Saturday will be pretty dramatic, as it usually is, as highs will plummet to the upper 70s and low 80s. You’ll also notice more cloud cover which will pave the way for an increasing chance of thunderstorms Saturday evening. 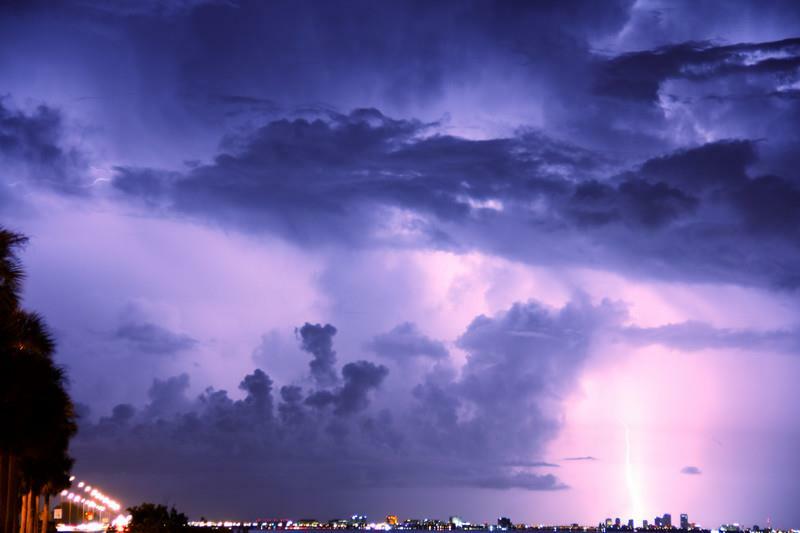 In the latest forecast discussion by the National Weather Service, it was pointed out that while there won’t be a lot of moisture for thunder “showers”, there could be quite a bit of lightning, which could pose a fire threat. 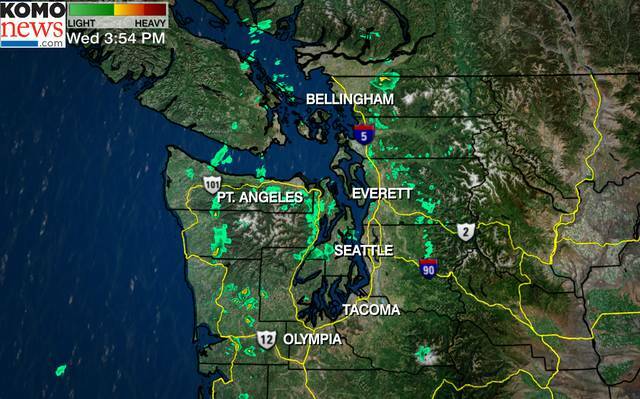 As always in these situations, the best chance for thunderstorms is in the cascades. More cooling takes place on Sunday and wouldn’t you know it…we’re back to normal. 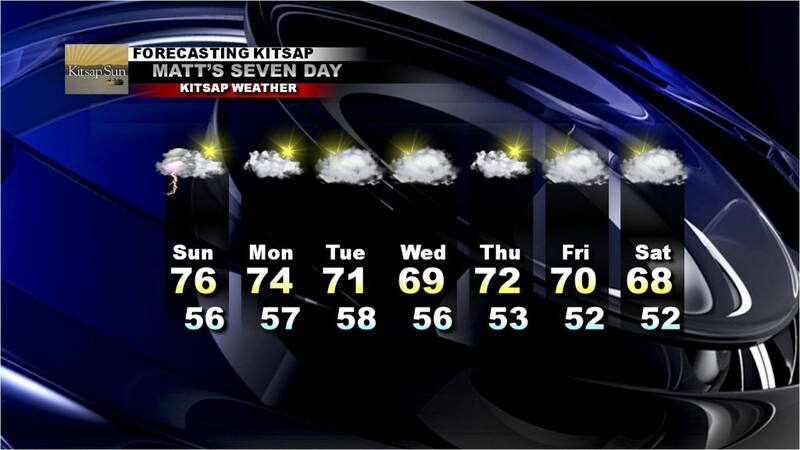 Morning clouds, afternoon clearing and highs in the mid 70s. We’ll discuss the long range in a couple days, but for now try to stay cool and use plenty of sunblock! Also, please take careful note that it will be extremely dry for the foreseeable future, so be careful with and around fire. It has been an active wildfire year in the west and we don’t want it getting out of control in our neighborhoods! Have a safe and fun day everyone! Hello all! I am sitting at a BYU cafeteria in Provo, UT right now attempting to update all of you on the incoming heatwave with a battery life at 16% ;). 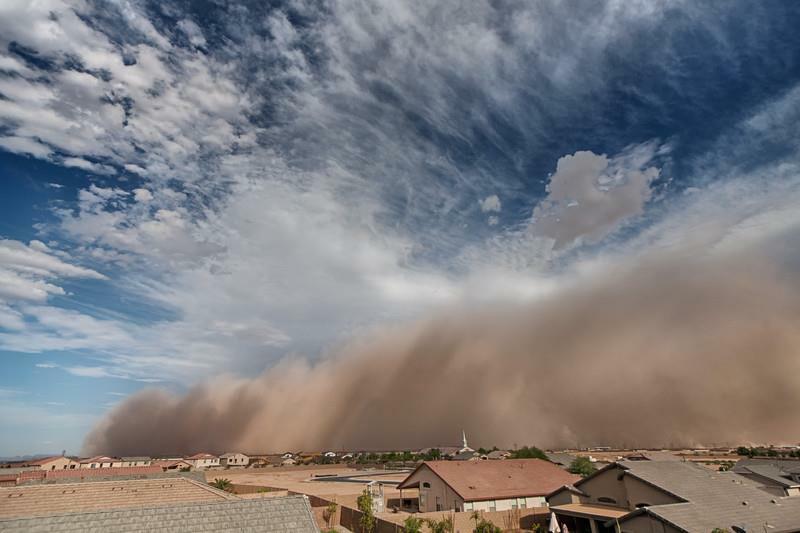 As is often the case with dramatic weather events around here, many details can be confused or inflated to come across as either more or less critical than the actual event really is. 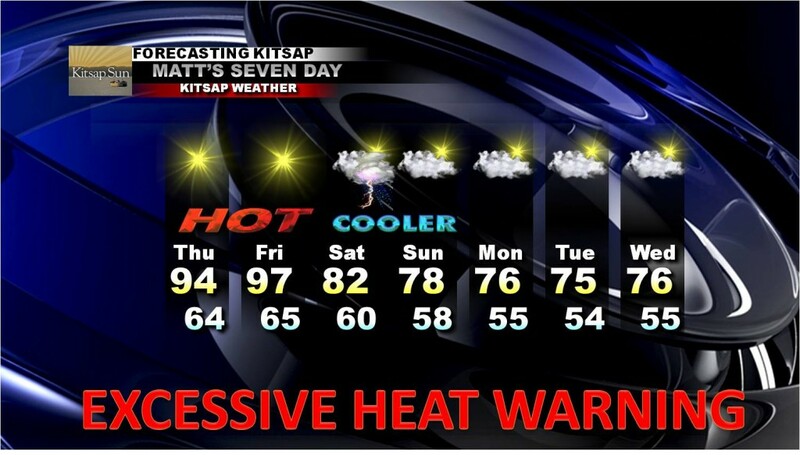 In other words, this time around, yeah it’s going to get hot, but it’s not anything we haven’t seen already. In fact, temperatures will closely resemble our last 90+ degree streak earlier this month, when highs reached the upper 90s! 97 degrees was recorded at Bremerton National Airport on Sunday, August 5th and that’s the closest we’ve been to 100 degrees since July 2009. And there’s no evidence that the temperature recorded was a fluke. In fact, studying the hour by hour numbers on the 5th of August, it seems perfectly reasonable that 97 degrees was in fact reached. FRIDAY. THE EXCESSIVE HEAT WATCH IS NO LONGER IN EFFECT. Temperatures undoubtedly will be hot, but likely not much warmer than what we experienced earlier this month. Increased humidity, however, could make it feel hotter than it actually is. Records could also be broken once again, but we’ll take a more in depth look at that tomorrow. Everything else is still expected to make an appearance: thunderstorms later Saturday into Sunday, a moderate cool down and getting back to seasonal norms next week. Have a fantastic evening, all! 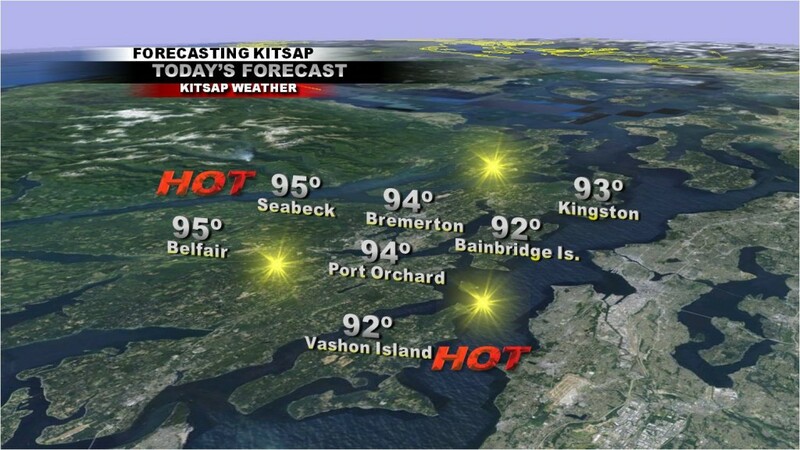 In what ways is the Kitsap Peninsula affected by these heatwaves? It seems like yesterday we were having this discussion about heatwaves and thermal troughs in Western Washington. It wouldn’t be a bad idea to refer you to Scott Sistek’s article on thermal troughs and get acquainted with the kind of weather pattern we’ll be experiencing within the next couple days. As a side note, yesterday’s forecast temperature was admittedly a disaster, with a forecast of 79 and an actual high temperature of 88! It’s a daily struggle to find the right temperature for every day of the week. Sometimes you win the lottery, other times you don’t. I think that’s one of the reasons I’m so drawn to forecasting weather in this part of the world. As hard as it is, it definitely has its rewards. Not every heatwave, snowstorm, windstorm or arctic blast materializes exactly as expected, but the goal is to get as close as possible, and when it happens it’s the best feeling ever! On the Kitsap Peninsula, there are a lot of factors that make our weather so unique (and challenging to forecast!) and one of those things is: offshore flow. We’ll have a discussion on winter time offshore flow in a few months, but for now we’ll focus on the summer east wind. As the oven door flies open and the hot desert air spills over the Cascade mountains, the foothills of Western Washington is the first to bake. 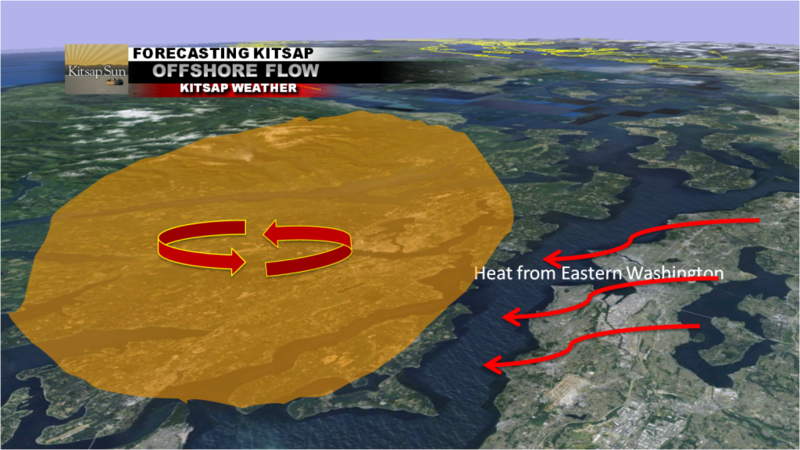 This hot air then rapidly slides down the mountain and envelops the Seattle area, which in turn races across the Puget Sound, smothers the Kitsap Peninsula and then a part of that flow hits a barrier. 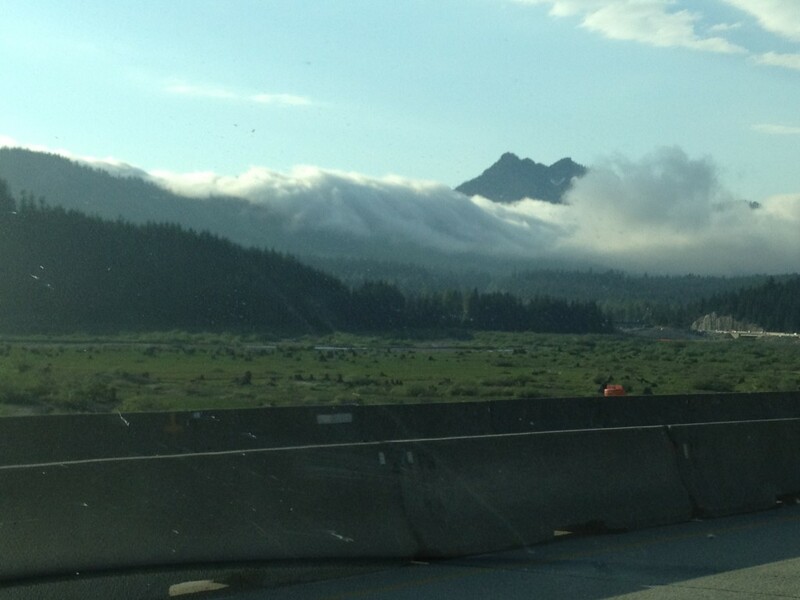 The Olympic Mountains serve as a barrier between us and the Pacific Ocean. Usually when cold air spills over from Eastern Washington, it settles in a “bowl” on the peninsula due to its high density and sinks. On the other hand, hot air usually just continues to circulate, leaving room for slightly warmer daytime temperatures on this side compared to Seattle (some examples include the July 2009 and early August 2012 heatwaves where Seattle started warmer at first due to offshore flow, but we ended warmer). And when you add a thermally induced trough of low pressure to the mix, which will be the case this time around, it gets even hotter. The reverse is often true for cold weather. But it’s a lot easier to scour out hot weather on the peninsula than it is cold weather, mainly because heat is less dense. 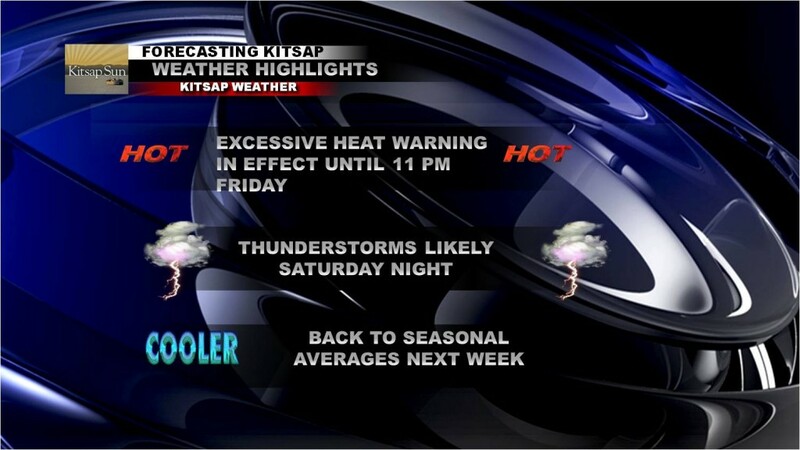 So there’s a little info on heatwaves and how the Kitsap Peninsula is affected during such events. And wouldn’t you know it, we’ll get to apply this principle a little bit this week! Tuesday will feature some morning clouds, thinning out to just high clouds and temperatures a few degrees cooler in the upper 70s to low 80s. Offshore flow kicks in Tuesday night and you’ll notice Wednesday will feel a lot like today as highs will reach the mid and upper 80s. Then we bake. 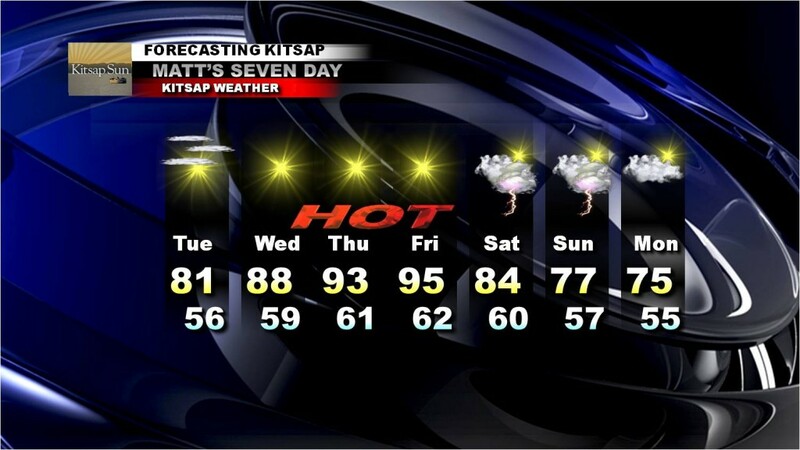 Thursday and Friday will feature clear blue skies and hot temperatures in the low and mid 90s. We could break some more records this time around…we’ll see how likely it is to break them a little later on this week. And then next week will be the same old, same old as morning clouds and afternoon sun once again enter the picture to cool things off. Don’t you love our wonderful natural air conditioning?